How to Convert a Document to Print2Flash Format (Adobe ® Flash ® (SWF) File or HTML5 File)? You can convert a document to Print2Flash format (Adobe ® Flash ® (SWF) file and/or HTML5 file) while working in any application that produces printable documents (for example, Microsoft Word, or Excel, or PowerPoint). Open the document you want to convert in the application suited for viewing or editing that kind of documents. For example, Microsoft Word documents can be opened with Microsoft Word. In most cases you need simply to double-click the document in order to open it. Select Print command in this application. In most applications it would be a Print button on the toolbar or File > Print option in the main application menu or you may press Ctrl-P keys. If you do not see such a command there, refer to the application documentation on how to print documents from it. For Printer Name, select Print2Flash 5 Printer. Set the printer options you want to apply to the converted document. For example, in some applications you can print a range of pages or the selected pages. Click Properties if you want to open Printer Properties Window to specify the page orientation, page size or resolution of the converted Print2Flash document. Click here for more information on this. Click OK or Print button. The document is converted to a Print2Flash document and appears in the Print2Flash printing application. The progress window is displayed to show you the conversion process is taking place. Please wait until it is finished. Select File > Save to save the document in the desired location. 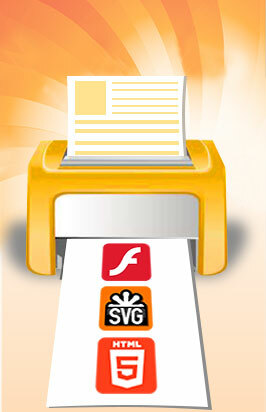 There are also four other ways to convert a document to Print2Flash format. Though they may appear easier than the previously described method, they are less flexible as they do not allow customizing the way documents are printed. If you need to convert document with hyperlink support, you may use only drag-and-drop or printing application conversion methods. The document is converted to a Print2Flash document and appears in the Print2Flash printing application. The progress window is displayed to show you the conversion process is taking place. Please wait until it is finished. From Microsoft Word, Excel and PowerPoint applications. Choose "Print2Flash/Convert to Flash (.swf) or HTML5/SVG format" option from the application menu or click "Convert to Flash (.swf) or HTML5/SVG format using Print2Flash" button on the custom Print2Flash Toolbar. If you use MS Office 2003 or earlier version and you do not see Print2Flash Toolbar, you need to right click the toolbar area and make sure Print2Flash Toolbar option in the shown menu is checked. To access this toolbar and menu in MS Office 2007 or 2010, you need to switch to Add-ins tab on the ribbon. Note: You cannot edit a converted Print2Flash document. If you need to update the document, you must make changes to the original document and then convert it again to a Print2Flash document.